Canine Lover. Coffee addicted. Forward thinking. First thing I do in the morning is walk my dog in search of a decent cup of coffee. One morning I woke up and thought why not both – coffee for me and a treat for my dog. That’s how Chateau le Woof was born! Now as a barista and a proud pet owner, I get to combine the two in one spot - and so do you. With over 15 years in the restaurant and hospitality industry, I learned about what is arguably the best coffee on the market, La Colombe, and sought out their expertise and training. A chocolate Chihuahua, leading a leash-holding woman, prances into Chateau le Woof. Rocky, for that is his name, is a regular. He’s coming to meet his girlfriend, Lola, who’s sitting pretty in a sweet sweater on the sofa. In puppy love, they romp around and run in circles while everyone coos and oohs at their coy cuteness. Soon, they are joined by a parade of pooches who have come to the chic countertop café for some doggie down time. Chateau le Woof, which Natassa Contini opened in September, is designed to go to the dogs (and the select humans they deign to invite to their five-woof watering hole). Lola all dolled up for Rocky. 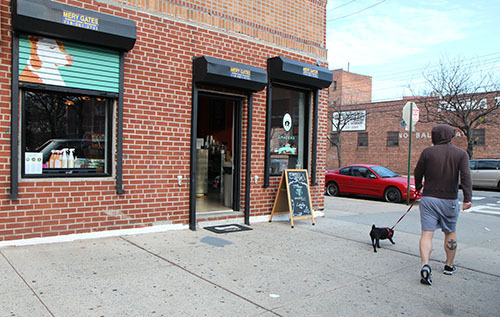 The canine clientele allows its people to stop in for Parmesan pound cake and macchiato cortados as long as they bring home doggie bags — pet food and treats. When the café closes, the bowwows have their playtime and parties. Natassa, a longtime dog owner, came up with the idea when she was out walking King, her 13-year-old pitbull rescue. She recently acquired Lola, who is only 4 months old, from someone in the neighborhood who was moving out of the country. Natassa sells pet food and people food. Chateau le Woof was a natural for Natassa because she has made her career in the restaurant/nightclub business. She and her fraternal twin, Jenifer, were born in Greenwich Village. Their mother, who is from Brazil, and their father, who hails from Brooklyn, divorced when they were 5. Chateau le Woof specializes in coffee. At 12, their mother moved them to Honolulu, Hawaii, where the family frequently spent vacations. “We traded the Big Apple for the Pineapple,” Natassa says. A wall for art — and leashes and dog toys. Natassa, petite, perky and perpetually smiling, has one part-time helper, but today, she’s working solo. That means nonstop. When she rings up a cappuccino, she gives the customer a sample packet of Natural Balance’s rabbit and potato dry-food formula. “This is good if your dog has food allergies,” she says. Where were we? Oh, yes, when Natassa graduated from high school, she returned to New York City, taking up residence in the East Village. She soon started a career in nightclubs and restaurants, working as a coat check, waitress, bartender and manager. In fact, that’s what she had been doing for 17 years when the vision of Chateau le Woof, her French poodle café, came to her. The corner space announces itself with dog portraits painted on its metal gates and traditional French tunes like La Mer and La Vie en Rose that waft out into the street. Natassa’s eclectic menu ranges from Brazilian cheese bread and spinach ricotta puffs to homemade chocolate chip cookies. 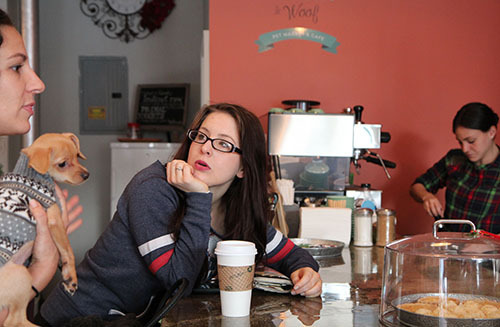 Lola, the cafe mascot, and Natassa. The canine choices include Natural Balance, Orijen, Blue Buffalo and Weruva. Flavors — poulet et canard, poisson and agneau — are written in French on the chalkboard behind the café counter. Natassa sees Chateau le Woof, which hosts music and arts events, as a community center for people and pups. Rocky + Lola: Puppy love unleashed at Chateau le Woof. Between now and then, though, she’ll fill hundreds of coffee cups and play with scores of dogs. Amid the dogfest, a canine-less customer comes in. “Ain’t it good to have a place you can bring your dog to,” he says as he stoops to get a sloppy, wet kiss from Lola.